ÖBB 54.14, ex KkStB 60.115 (Wiener Neustadt 4221/1899) is the sole surviving locomotive of his type. Photo taken at the Heizhaus Strasshof on June 20, 2009. Another view of this machine; picture taken on the same occasion. 334.140, ČSD, formerly KkStB 60.520, BMMF 269/1908. Postcard from my collection. This picture of an unknown Class 60 (earlier variant) was published in the Lublin issue of the Gazeta Wyborcza daily on February 4, 1998. The photo was taken in Lublin, most probably between 1915 and 1918. An unknown Class 60 engine, photographed probably in 1916. Freight cars in front of the locomotive may be indicative of expected mine hazard. Photo from my collection. KkStB 60.01 (Wiener Neustadt 3987/1897), location and date unknown. Source: www.de.wikipedia.org. Side drawing of ČSD class 334.1; source: EZ vol. 2. KkStB 60.249 (StEG 3422/1907) was kept by BBÖ and withdrawn in 1937. Factory photo; source: www.commons.wikimedia.org. DRG 54 027 (StEG 3411/1907), RAW München-Freimann, January 25, 1940. This engine began its life as kkStB 60.237; kept by BBÖ and impressed into DRG following Anschluss, it later served with ÖBB as 54.27 and was written off in November 1955. Source: Bundesbahn-Ausbesserungswerk München-Freimann by Anton Joachimsthaler, 1985. Ti12-152 (ex 60.513,StEG 3491/1908) with PKP designation in Russian script, captured by Germans at the Eastern Front. Later it was re-numbered 54 044. Returned after the war, it became Ti12; withdrawal date is unknown. Source: Lokomotiven ziehen in den Krieg by Hansjürgen Wenzel (Verlag Slezak, 1977). An unidentified kkStB class 60, location and date unknown (probably a factory photo). Source: Die Lokomotive June 1904. KkStB 60.506 (StEG 3394/1907), location and date unknown. 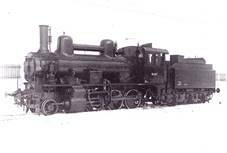 This locomotive went to PKP and was re-numbered Ti12-148. In 1939 it was taken by Soviets and impressed into NKPS. 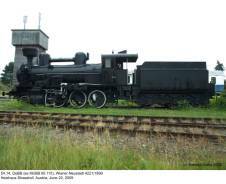 Captured by Germans, it became 54 046. After the war it went to ÖBB and was later returned to PKP and re-numbered again, this time becoming Ti12-2. Withdrawal date is unknown. Source: Die Lokomotive December 1907. 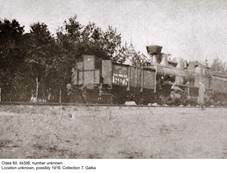 In 1895, Wiener Neustadt built the prototype (s/n 3826/1895) of a new 1-3-0 freight locomotive with compound engine, designed by Karl Gölsdorf and based on earlier Kaiser Ferdinand Nordbahn (KFNB) class VIII – later KkStB class 260. Compared to the latter, it was shorter, with axle base reduced by 650 mm, and the boiler was elevated by 300 mm. Lead Adams idle axle was fitted to improve running qualities, especially on tight curves: the engine was intended mainly for lines in mountain regions. Maximum speed was set at 60 km/h. First six examples went to various private railways, later incorporated into KkStB (Kaiserlich-königliche österreichische Staatsbahnen). 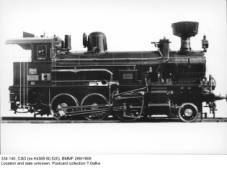 Prototype was initially numbered 6001; numbering then went up to 6099 and next engine was 16001. In 1905, when KkStB introduced new designation system, these locomotives were all classed 60 (this number being used for the second time – ‘old’ class 60 comprised two locomotives built in 1872 and withdrawn in 1893 and 1895, respectively) and numbered from 60.01 onwards. In order to match last two digits of old and new service numbers, 6099 became 60.99 and 16001 became 60.101, so that there was no 60.100. Production continued until 1910, when this engine could be by no means judged modern; yet it still performed well in mountain regions. Total output amounted to 297 examples. 22 more delivered in 1907, numbered 60.500 through 521, were fitted with Gölsdorf-Clench steam dryer – they could be easily distinguished by single steam dome instead of two connected with a horizontal tube and were slightly lighter. First five were in fact rebuilt from ‘plain’ 60s and service numbers originally assigned to them (60.194 and 212 through 215) were later used again. Second 60.194 (WLF 1757/1908) was fitted with Crawford-type steam dryer and three engines (60.800 through 802) were built with Pielock-type steam superheater in 1908. All these novelties did not find widespread use. The above figures sum up to the total of 321 engines for KkStB, although – for the reason mentioned above – some sources give 322. They were built by five factories: BMMF (11), Krauss Linz (3), StEG (146), Wiener Neustadt (103) and WLF (58). Moreover, Südbahn received further 73 examples from Budapest (9), StEG (25), Wiener Neustadt (18) and WLF (21). Class 60 was one of the most important light freight locomotives in Austro-Hungary and served as a basis for several other types, built both for KkStB and various private railways. Many 60s were brought by the Austro-Hungarian army to the regions which later became south-eastern Poland, after the retreat of Russian forces in 1915. Some were destined to remain there until the next world war, albeit with other service. 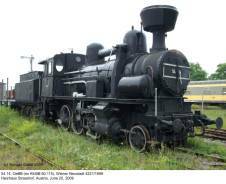 After WWI these locomotives shared the fate of other Austro-Hungarian classes. Austrian state railways BBÖ kept 57 former KkStB engines; 41 went to Czechoslovakia (ČSD class 334.1), 39 to Italy (FS class 604), twelve to the Kingdom of Serbs, Croatian and Slovenians (SHS, later JŽ class 131) and four to Romania (original service numbers retained with state railways CFR). Eight engines were lost in Russia and the fate of one is unknown – possibly it also went to CFR, but this is not confirmed by Romanian sources. Südbahn locomotives were divided between Hungary (21, MÁV class 330), SHS (29) and Italy (23) – FS and JŽ included them in the above-mentioned classes. Polish state railways PKP were the largest recipient of these engines. In all, 159 examples were taken over. Two (former 60.124 and 60.278) had seen some service with BBÖ and arrived as late as in July 1924. All were classed Ti12 and given consecutive service numbers. Of these, Ti12-146 through 153 belonged to the second sub-type (60.500), while Ti12-154 and Ti12-155 represented the third one (60.800). The highest numbers went to three engines formerly used by private railways Zeltweg-Wolfsberg (one) and Lwów-Bełżec (two), which had also been given consecutive KkStB service numbers. As it was the case with most Austro-Hungarian types, especially older ones, all served in southern and south-eastern Poland, their low axle load being an advantage on tracks of often poor quality. They were, however, not liked by crews. Seats were judged very uncomfortable and open cab was a nuisance, especially when running tender first in rainy or snowy weather: according to some statements, reading boiler gauges in such conditions was almost impossible! Withdrawals started pretty soon; this type was certainly obsolescent and compounds were never favored by PKP. According to LP, as many as 64 engines were written off before 1936 and until December 1938 twenty more followed. In April 1939 all 75 Ti12s still in use were assigned to the Lwów regional railway management and based in six depots – the largest numbers in Kołomyja (23) and Zagórz (19). After the September campaign DRG took over only ten Ti12s, later numbered 54 031 through 040 – all these numbers were used for the second time. Soviet NKPS acquired 57 examples plus three more already withdrawn from use. Some were later converted to the 1524 mm track. Of these, 25 were later captured by Germans. A few were impressed either into DRG or Ostbahn, but German railway authorities were certainly not eager to keep these obsolete engines in service. Some were withdrawn before 1945 and seven transferred directly to CFR; numbered 130.902 through 907 and 130.921 (again, the last one is not confirmed by ITFR), they were later returned to NKPS, as were considered Soviet property. Information on eight Ti12s is lacking. Most engines in German service ended up in Austria, so all returned to PKP after the war – fourteen in all – came from ÖBB. I have no information on their subsequent service, but most probably last were withdrawn in early 1950s. Last Czechoslovakian and Soviet engines of this type were written off in 1951 and a handful remained with ÖBB and MÁV until early 1960s. The sole surviving locomotive of this type is ÖBB 54.14 (Wiener Neustadt 4221/1899). Built for KkStB and delivered as 16015, it was later re-numbered 60.115 and remained with BBÖ after the war, to become DRG 54 014 in 1938. One of the last 60s in service, it was withdrawn in August 1963. Currently it can be seen at the Heizhaus Strasshof. 1) With class 156 tender; 60.500 through 521 were lighter by about 1 500 kg. 2) Including 73 for Südbahn. - Josef Pospichal (private communication).